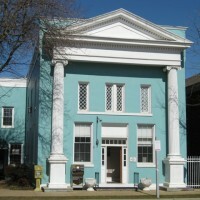 The Downtown Gloucester Historic District is located in Gloucester Court House village in the middle of Gloucester County, Virginia. 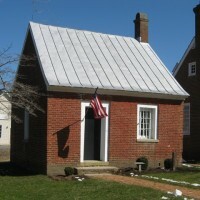 Gloucester Court House village has been the administrative center of Gloucester County since at least the time of the 1766 construction of the third county courthouse and the official 1769 establishment of the Town of Botetourt (modern day Gloucester Court House village). The focal point of the town development since before its legal creation has been the courthouse, which has existed at or near its current site since c.1680. The town has developed slowly over three centuries from a wealthy, completely agrarian population and economy to a small town today. After a slow recovery from the Civil War, industrialization and new forms of commerce brought more of the population into the central village of Gloucester Court House and led to a developmental expansion down Main Street beyond the original courthouse circle. The overall population of the county has grown slowly through the second half of the twentieth century and as a result, the downtown area has maintained its historic character and not seen the huge declines and disruptive redevelopments of many downtown areas. The historic district was found significant under Criteria A, C and D for its development as a rural village and primary population center in Gloucester County from the Colonial period to the modern era, and for its architectural character and archaeological resources spanning the period from 1754 to 1960.